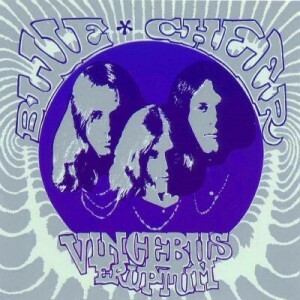 Let us today pay tribute to Blue Cheer’s astounding debut LP VINCEBUS ERUPTUM, their teenage master class in colossally loud avant-garde guitar dynamics released exactly 50 years ago and arguably the first rock album genuinely deserving of the description ‘Heavy Metal’: stumbling and inchoate a-rhythmical white noise guitar, thundering tribal drumming, soul bass riffs smothered under sheets of formless Gibson guitar mung. ‘Bracing atonality’ quipped a hysterical Lester Bangs, enchanted by these young bikers named after a particularly snarly batch of bathtub LSD. And to whatever insane heathen divinity took possession of VINCEBUS ERUPTUM’s producer Abe ‘Voco’ Kesh during those strange days at North Hollywood’s Amigo Studios, we can only raise our cups and give praise for the revolutionary manner in which he oversaw the recording of this adventuresome San Francisco power-trio. For nothing before nor anything after VINCEBUS ERUPTUM ever sounded so shocking as these six mind-numbing and sustained barbarian sludgefests. Revolutionary? Indubitably. Indeed, VINCEBUS ERUPTUM demanded a whole new set of ears, a whole new set of values. To those mid-60s hordes in thrall to Clapton’s Cream, Blue Cheer was over-amplified and discordant trash: shed-building with choruses. But to those Future-heads accepting of the Velvet Underground’s equally defiantly anti-hippie sensibility, Blue Cheer’s deployment on VINCEBUS ERUPTUM both of USAF-levels of Marshall amplifier bombast AND ‘When The Music’s Over’-levels of pindrop-silence had created a veritable Rock Godhead. Moreover, no less that the MC5 themselves refashioned themselves into that KICK OUT THE JAMS Sludge Machine we know and love only AFTER supporting Blue Cheer at Detroit’s Grande Ballroom. Indeed, two legendary ‘70s Japanoise guitar manglers, Takeshi Mizutani (of Les Rallizes Denudés) and Keiji Heino, even cut their teeth in a Blue Cheer cover band. But only with the arrival of the early ‘90s proto-Doom scene that centred around Dylan Carlson’s Earth and Bobby Liebling’s gnarly Pentagram did the rest of the world finally catch up sonically with the distorted guitar worldview that VINCEBUS ERUPTUM had evinced over two decades previously. And so, though derided by the contemporary US press as being nothing more than a gauche soon-to-be-forgotten J. Hendrix parody, it is still to VINCEBUS ERUPTUM that every subsequent generation of genuine outsider rock’n’roller has beaten a path when searching for sonic rivals with which to do battle. So let us today raise our cups in salute to Blue Cheer: to bass player and singer Dickie Peterson, to drummer Paul Whaley, and – most of all – to deaf guitarist Leigh Stephens. Brothers, we salute ye! This entry was posted in Heroes, Revolution, World Events. Bookmark the permalink. Right on. One of the best albums ever. The lack of love for Blue Cheer is a DISGRACE. This is a truly great blog, btw. His introduction and “Interview” with the band remains stamped in my brain seeing them at 12 years old. I remember the Amp Hum was so loud that Steve Allen asked the band what that annoying Hum was, and then suggested they change their name to The Annoying Hum. The sound did come out of our TV set loud too, Got the single (summertime Blues) the next day. Ah so now I understand the inspiration behind your car’s makeover! Yes, in an attempt to free himself of the City Dweller tendency to park overly correctly, a couple of years ago my husband embarked on a spree of exceptionally bad parking. So, when he decided to hand-paint our car, he opted to name it in honour of the first Blue Cheer LP for its sheer brutality. Thereafter he was delighted to discover that the band – despite ending up with a very Pig Latin-ish translation – originally intended the title to mean “broken free from chains” (or something like that). Music like Blue Cheer gets me in the mood for work. I’m scoring myself a copy of this on payday!